The Pacific Marine and Estuarine Fish Habitat Partnership’s Estuaries Explorer data tool was recently added to the NOAA Digital Coast website. The Estuaries Explorer application enables you to explore the estuaries of Washington, Oregon, and California and compare them to each other. You can combine dynamic filters and an interactive map to find specific estuary types you are interested in, or estuaries that contain focal species of interest. 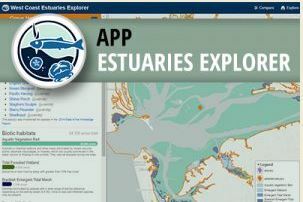 You can explore estuaries in more detail and find a specific estuary by name or location. You can also zoom to a specific area on the map to compare estuaries and the filters automatically update to show you the number of estuaries in that area that meet different conditions. The Estuaries Explorer tool integrates a wide variety of datasets from along the West Coast, providing restoration practitioners, researchers, and resource managers with comprehensive estuary data for improved decision-making. Find it on the NOAA Digital Coast website here or access it from the PMEP website here. PMEP has issued a Request for Proposals for Nearshore Science support for our nearshore project. PMEP seeks to identify a contractor to conduct literature reviews, compile available information, and collaborate with regional experts including the PMEP nearshore regional working group to develop a “State of the Knowledge” report on West Coast nearshore habitats. The full RFP can be found at the Pacific States Marine Fisheries Commission website here. PMEP hosted a Data Tools Cafe at the 9th National Summit on Coastal and Estuarine Restoration and Management, held in Long Beach in December 2018. The session introduced PMEP to restoration practitioners, researchers, and resource managers as it highlighted the many functions and uses of PMEP data tools. The session featured hands-on exercises to get participants familiar with the data tools. Participants walked through the Estuary Explorer tools, finding which estuaries on the west coast are at low-risk for habitat degradation, where tidal forested wetlands are located, and where wetland restoration would most benefit federally managed species. These questions showed the value of the data tools to habitat conservation and restoration planning, minimizing impact on Essential Fish Habitat, and assessing the benefits of projects to species and habitats. The session exemplified PMEP’s collaborative structure by including speakers from The Nature Conservancy, NOAA Fisheries, Oregon Department of Land Conservation and Development, Estuary Technical Group, and the Pacific States Marine Fisheries Commission. This fall the Pacific Marine and Estuarine Fish Habitat Partnership (PMEP) worked with the talented designer Karyn Savory to refresh its logo design. Check out the website to see it’s new look. PMEP members can download files from the Committee Portal for official PMEP use. Other partners and contributors, please contact the PMEP Coordinator for the file and use guidelines.